Gameweek 25 brings the first double gameweek of the season on the heels of a high-scoring midweek that featured nine teams scoring at least two goals. 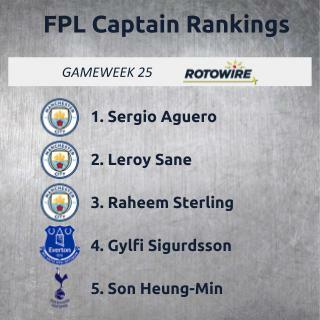 While some teams struggled to seal three points, it went as expected for most fantasy stars, with Sergio Aguero scoring early in a loss, while both Paul Pogba and Pierre-Emerick Aubameyang managed to produce even if their teams struggled. Unfortunately, the same can't be said for Mohamed Salah or Eden Hazard. Teams like Spurs (v. Newcastle) and Chelsea (v. Huddersfield) have good matchups in Gameweek 25, but all eyes will be focused on Everton (v. Wolves, v. Man City) and Manchester City (v. Arsenal, at Everton). If Man United (at Leicester) or Liverpool (at West Ham) were at home, it'd be a different story, but it'll be hard not to give the armband to a player without two matches. The problem with Man City is that there's no guarantee as to who will start both matches, with players like Gabriel Jesus and Riyad Mahrez always in waiting. That puts some doubt into anyone backing Aguero for the armband since his only start may be at Everton. Raheem Sterling has played a full 90 in the last six league matches, but that also means he could be rested for one, though that'd mean Leroy Sane likely starts both and that's a stretch. Funny enough, Aymeric Laporte may be the most likely to start both matches, and a clean sheet is always in the cards for City. If you don't want to overthink this, Aguero gets the nod for me with an appearance on the score sheet in his last five starts. Next I'd go Sane, Sterling and Laporte, in that order. Everton don't have as many viable players, and there's also a chance they get shut out against Man City. Richarlison and Gylfi Sigurdsson are the only ones in consideration for me, with hopes of multiple goals in the first match against Wolverhampton. Neither has been easy to trust over the last month, so it's still not a guarantee for production. Sigurdsson gets the slight edge with four shots on goal and seven chances created over the last four matches compared to three and zero, respectively, for Richarlison. For those with a single match, Spurs are the team in the best spot for me, even if that doesn't correlate with the odds. Newcastle are coming off the huge win against Man City and have been the opposite of consistent this season. It's hard to go against Son Heung-Min at this point, with six goals and three assists in his last six league starts. He incredibly played a full 90 on Wednesday following the Asian Cup and at this point, there's no reason to doubt his willingness to help the club. While he's questionable to play, if he's guaranteed to make the roster, I'd put him above Salah. I'd also put Fernando Llorente above Christian Eriksen, which is odd to write. Llorente has nine shots, including three on target, and three chances created in his two starts, and the opportunities will continue to come as the front man. If you prefer backing the odds, Chelsea are the biggest favorite on the slate against Huddersfield. The problem is that no one on their team is reliable and they just got throttled at Bournemouth. Hazard has disappointed too much to put him into the captain conversation, while Gonzalo Higuain needs to take at least one shot before I recommend him. Liverpool are also a bigger favorite than Spurs with a trip to West Ham. The Hammers have conceded nine goals in their last three matches in all competitions, but they also beat Arsenal 1-0 in their last home match. I'm not convinced Liverpool are playing well at the moment, from drawing 1-1 with Leicester at Anfield to giving up three goals to Crystal Palace and scoring only once on a penalty at Brighton in their last away match. It's hard to go against Salah, but he isn't getting an overwhelming number of opportunities. In his last four league matches, he has three goals from eight shots, including five on target, to go with six chances created. He's incredibly efficient, but I have my doubts with how Liverpool are playing as a whole. Man United are also a little harder to trust at Leicester, who have allowed just 12 goals in 11 home matches this season. Given United's recent performance at home against Burnley, I'm fine with giving the armband to someone other than Pogba or Marcus Rashford. There are a couple other good matchups, but it'll be hard to captain someone on Burnley (v. Southampton), Crystal Palace (v. Fulham) or Bournemouth (at Cardiff) over someone with two matches.